R11 - Courtesy of the previous winner: Ghosty Kun! Hmm... I guess I could try do something... WHO DARES TO CHALLENGE THE ALL-MIGHTY NUBLET!? Heads-up: the Harken on the set sheet has the background color as one of his armor colors. Looks good, actually, but I digress Just in case someone's taking the mugs right out of the first post. 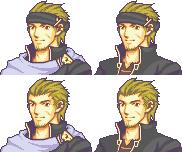 Harken joins Fiora in the niche category of "characters who have green armor in my headcanon". I'm making a thing for this— here's to hopefully completing it this time! I saw Hayden's hair and frown and Harken's eyes and just couldn't un-see Zhuge Dan (Dynasty Warriors). I may have gone overboard on the trim, but the shoulder pads are Harken's cut off at the middle part and the clothing is Lloyd/Hayden's. Yeah... they ended up looking just weird and after few minutes of experimenting, they ended up looking even more weird so... yeah, abandon the spikes! Updated entry (on my previous post... nothing major) and uploaded few different "versions" of the entry.